Your HVAC system is one of the most important parts of your home, that’s why most people dread whenever they start to hear a rattle or notice that their home isn’t as warm or as cool as it used to be. Many homeowners have no problem trying to troubleshoot a backed up toilet, or even trying to unclog a slow-emptying drain. But when it comes to fixing a malfunctioning HVAC unit, most people don’t even know where to start. Sometimes hiring a repairman just isn’t in the average homeowner’s budget, but you’d be surprised by how many common HVAC problems can be solved by doing a few simple things. Before you call the repair man, see if doing these things help your system. Does it seem like your HVAC system is struggling to keep air circulating through out your house? Do you feel like the temperature in your home is uneven? Before you think about looking into buying a new unit, you may want to replace the air filters in your unit. Ideally you should change your air filters every few months, but it isn’t uncommon for people to completely forget to change them all together. If you notice that something seems off with your heating or cooling, change your air filters may be able to fix the problem. If your air conditioner isn’t working after having it off for a few months, the problem way be easily fixable. Sometimes people forget how important the fan is in air conditioning units, and if the fan isn’t working your entire unit won’t be able to function. If the fan isn’t functioning you may have to find a repairman to fix it, but before you call someone out to check the fan you should check your breaker. 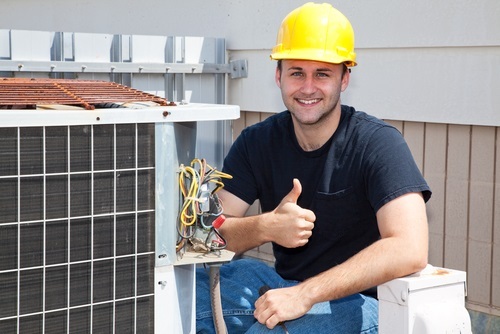 Old or faulty circuits can break, and you should make sure that power isn’t a problem before you spend money having a HVAC technician come to your home. We already mentioned the importance of changing your air filters, but air filters won’t be able to keep your entire system clean. Your air vents and ducts can pick up a lot of dust and dirt after years of use, and when your main air flow passage ways get too dirty your entire system can experience problems. If you’re able to easily and safely access your vents, you may be able to clean it yourself with the right tools. If you aren’t sure how to access the ducts and vents, you would be better off calling a professional so that they can do it properly. If you’re noticing water pooling around your AC unit, you should check to see if the condensate pump is functioning properly. The condensate pump helps make cooling possible, and if it’s broken your system won’t be able to de-humidify the air. Check to see if the pump is working by pouring water into the pan. If it doesn’t start, it’s a sign that your pump could be broken. If the pump is broken, you may be able to save some money on repair costs by purchasing a replacement part on your own. Check with your usual HVAC serviceman to see if they’ll allow that, and check with them to make sure that you have the right part and the right manufacturer. The same part is going to be different depending on who makes it, and Trane parts won’t be able to work in a 3M manufactured machine. Previous story What is Deburring?